“For everything there is a season,” writes the wise man in Ecclesiastes 3. Not only is that very smart fellow pointing us to a profound truth, his English translators are phrasing it beautifully. The vast majority of those folks are smart enough themselves not to mess much with the English construction of this well-known Scripture. If you’re not an English major, I hereby give you my blessing to tune out. Blessing or not, if you’re not some sort of word person, you’ll soon turn off anyway. But are you aware that the famous words above are breaking (beautifully) an “Editing 101” rule? Some rules you should never break. Spelling rules, for example. As a short-lived teacher of English 101, I discovered that between 87 and 93 percent of college freshmen (well, a lot of them anyway) are convinced that “alot” is a word. “Allot” is, but “alot” ain’t, and “allot” is not what they mean. As an editor, I quickly learned one of Ten Editorial Commandments. “Thou shalt quickly kill ‘there izzes’ and ‘there arzzes.’” What that means is that when a writer begins a sentence with “There is” or “There are” a good editor will prune those words because they’re almost always deadwood anyway. 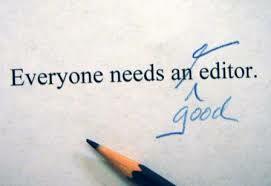 If you see many of them in a book, article, or manuscript, it’s a dead giveaway that the author went to press without an editor or the writer threw his editor into a deep sleep. Somebody goofed. “There are many bears who hibernate in January” may be true, but it’s drowsy word-wise. “Many bears hibernate in January” is a tad closer to coming awake. “There is very little to be gained from using ‘there is.’” Absolutely true. “Very little is gained from using ‘there is,’” is, however, greater gain. A quick Google search just brought up this “Op-Ed” title: “There Is a Long Campaign to Put the U.S. Economy Back on Track.” What does that mean? Maybe . . . “Putting the U.S. Economy Back on Track Will Require a Long Campaign.” Economists probably won’t notice anyway, but more reconstructive surgery than that will be required before this title dances much. Those dratted “there izzes” and “there arzzes” are guaranteed to hobble decent writing pretty much anytime an editor allows one to sneak in and live. Except . . . when the rule is turned on its head and needs to be.